Hesi ProLine TNT serves the basic macro elements for our plants. It is an essential NPK fertiliser for healthy plant growth. It helps not only our plants, but also the useful microorganizms in the soil. Dosage: 40ml / 10L Water. In case of frequent use mix 20ml fertiliser to 10L irrigation water. 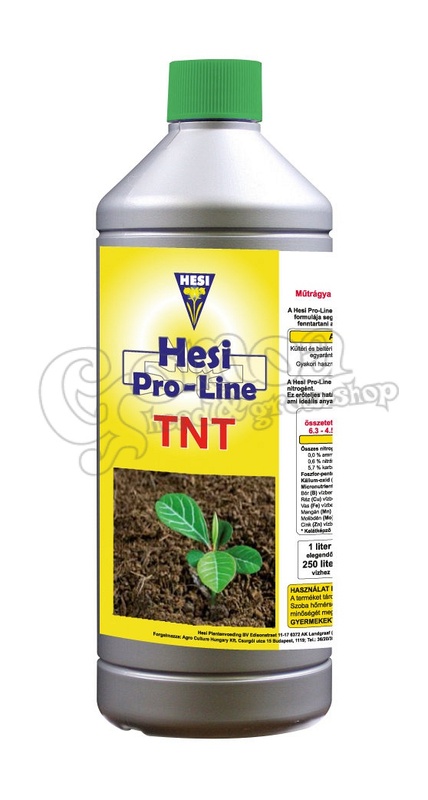 Hesi Pro-Line TNT can be used for inside and outside growing on soil and coco. Hesi Pro-Line TNT contains mainly natural form Nitrogen. This leads to a powerful effect, with minimal EC values. This is ideal for using great quantity fertiliser for mother plants and young plants alike. 1L solution is sufficient for 250L irrigation water.